Make dressing: Boil vinegar and sugar in a small saucepan over medium heat until slightly reduced and thickened, about 10 minutes. Heat a grill pan or light a grill, that has been sprayed with cooking spray or wiped with vegetable oil. Add watermelon slices and grill about 2 minutes on each side to produce grill marks. 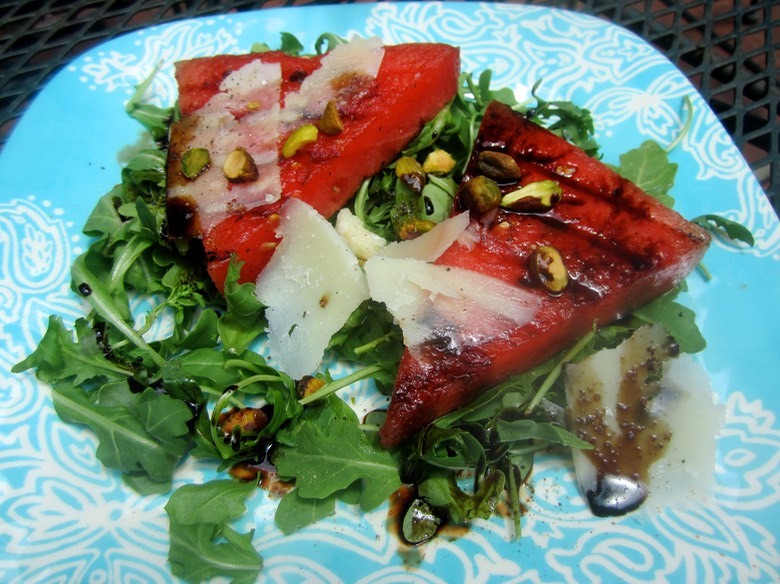 While watermelon grills, line salad plates with arugula. Top arugula with grilled watermelon slices. Top watermelon slices with Parmesan cheese and chopped pistachios. Drizzle with cooled balsamic dressing.